Pork in Adobo – A Great Flavor! This recipe consists of mixing the subtle and firm flavor of the pork with the spicy and smoky flavor of the adobo salsa. By mixing all these flavors a dish that delights all the palates is obtained because the flavor of the adobo salsa is immersed in all the pork , since the pork is marinated with the salsa. – This is a perfect dish to prepare at reunions and celebrations. Because while the pork is baked, there will be time to prepare other dishes that you require. When the pork in adobo is served we recommend putting tortillas on the table and the dish can be accompanied with: carrot salad with cream , white rice or refried beans. This recipe is very easy to make you only have to prepare a salsa, marinate the pork and at the end bake it. The recipe is given with pork leg because it is more juicy although it could also be prepared with pork loin so it will be easier to cut. 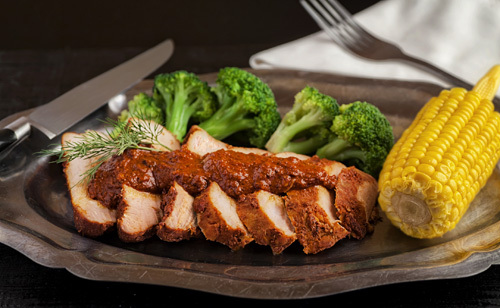 The salsa that is used to marinate the pork is prepared with achiote paste and you can prepare it with us. The marinade is prepare with apple cider vinegar because it has a sweet touch although white vinegar could also be used. The total preparation time is long of about 4 hours 45 minutes , since the pork is marinated and is baked for a long time. Discard the seeds of 2 pasilla peppers and 3 guajillo peppers. The 2 Pasilla Peppers with the ones you worked. 1/4 bar of Achiote Paste. Put in a baking dish the pork leg with the one you worked. Pour over the pork leg the adobo that was blended and smear it, with a spoon, through all the sides of the pork leg. Cover the pork leg with a piece of food wrap film. Put in the fridge the pork leg with the one you worked and leave it marinating for 3 hours, so the flavors mix. Take from the fridge the pork leg that was marinated and remove the piece of food wrap film. Cover the pork leg that was marinated with a piece of aluminium foil. The pork leg has to be covered so it doesn’t dry, besides a steam chamber is generated that leaves the meat juicier. Put in the oven the pork in adobo and leave it baking for approximately 1½ hours, until it is well cooked and soft. Tip: If you have a little left over of this dish... the next day you can make tortas or tacos of pork leg in adobo. Variation: If you want to taste this dish with a softer touch prepare the chicken adobo. Did you like the Pork in Adobo? For more convenience use a non-stick baking dish that is easy to clean like the Farberware. Buy these guajillo peppers because they have an extraordinary flavor. This is the best achiote paste that there is because the ingredients that are used in its preparation are of excellent quality, giving as a result an unbeatable flavor.